Get your workout the fun way by joining one of Semper Fit’s many athletic teams. On-base intramural leagues, varsity and All-Marine levels are available. Sports offered include softball, basketball, football, soccer, hockey, volleyball and tennis, just to name a few. Both men’s and women’s teams are available for most sports, and all provide opportunities for physical fun and fierce competition. All teams are open to military personnel, and many are open to military family members and DoD employees. Selected sports have afternoon and evening leagues, making it easy for anyone interested to get involved. Various tournaments are held throughout the year, making unit cohesiveness as important on the field or court as it is on the job! To review the wide variety of sports offered by MCCS Athletics and Sports, download the Sports Calendar PDF. Captain Edward Pinnell distinguished himself for the second year in a row by being selected to the All Military Soccer Team. After competing against each of the other services best goal tenders, Captain Pinnell not only made the team but was selected as the starting netkeeper for team USA that is participating in the 2017 CISM Championship. Edward not only is tremendous goalie, but for the past five seasons has been the San Diego Indoor Soccer League’s leading scorer. He also plays shortstop for MWHS-3 and helped the “Eagles” have the best regular season record and go undefeated in the Intramural Softball Championship playoffs. He is truly an outstanding athlete and most deserving as the 2016 Miramar Athlete of the Year. 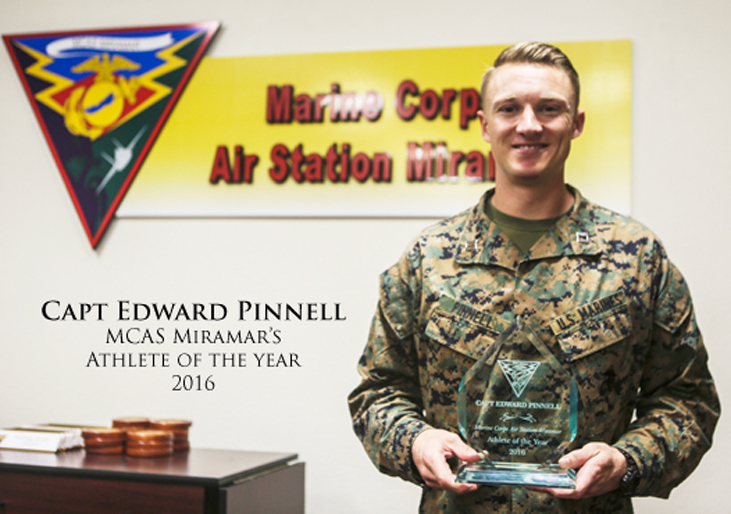 Captain Edward Pinnell, recipient of MCAS Miramar’s 2016 Athlete of the Year Award. 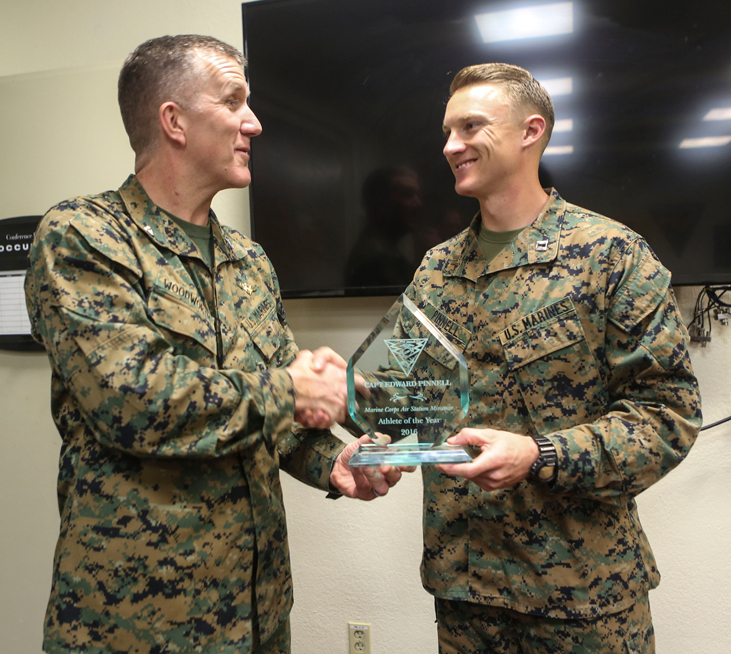 Captain Pinnell receiving the Athlete of the Year Award from Colonel Jason G. Woodworth, Commanding Officer, MCAS Miramar.